With QUANTUM, passengers can back their wheelchairs or scooters into the system, press a button and independently secure themselves. The relationship between the agency and Q’Straint began when Manatee County Government Transit Division Manager William Steele and Manatee County’s Transit Operations Chief Jim Egbert observed the QUANTUM system demonstration at the 2016 Florida Public Transportation Association (FPTA) Conference. Egbert and Steele expressed their interest in learning more, and scheduled Q’Straint for an on-site presentation for both the MCAT leadership team and transit operators. Both the MCAT leadership team and operators asked very specific questions about how the new wheelchair securement technology could benefit operations and passengers. In short, creating a real “win-win” for the community. This very focused and engaged interaction provides the important in-person forum, where any operational concerns are addressed right up front, and not during the pilot program. Understanding how the equipment functions, and addressing the “what-ifs,” put the operations team at ease, and both the Operators and Supervisors saw the program potential from the outset. QUANTUM’s side-arm lowers and hugs the wheel, safely securing the wheelchair with minimal operator assistance. After initial buy-in from the MCAT “team,” a community outreach forum was scheduled to judge the interest from MCAT customers. 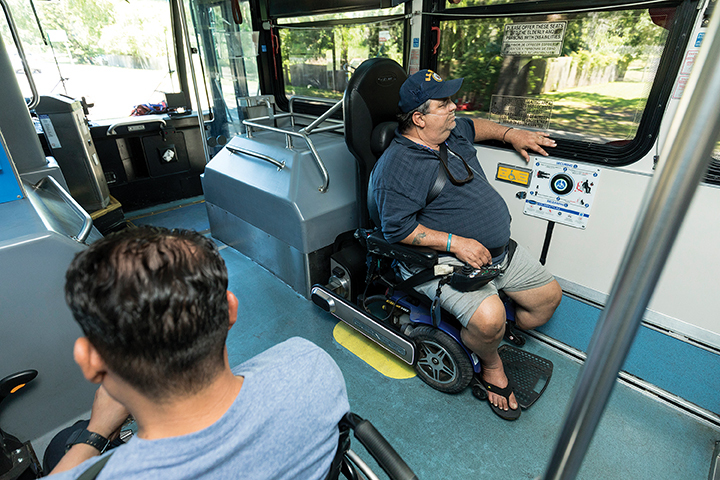 Surveys completed by customers confirmed their interest in the state-of-the-art wheelchair securement technology, and the potential benefits of the pilot program. The MCAT team then involved their Public Works Department leadership; and from that point forward, it was clear that everyone involved favored a six-month Field Evaluation Pilot Program. At right: Q’POD is the industry’s first fully integrated forward-facing wheelchair securement station specifically designed and tested for transit wheelchair passenger transportation. 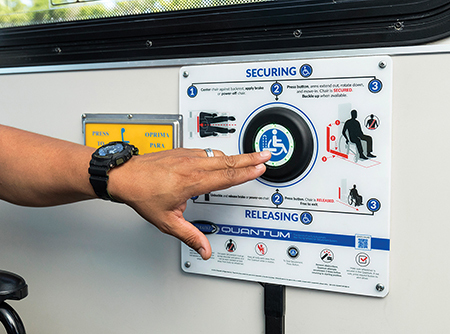 QUANTUM by Q’Straint is transit’s first fully-automatic rear-facing wheelchair securement station. Passengers back their wheelchairs or scooters into the system, press a button and independently secure themselves. QUANTUM’s side-arm lowers and hugs the wheel, safely securing the wheelchair with minimal operator assistance. If the passenger is not able to push the occupant button independently, the bus operator can push the button located on the dash – securing or releasing the passenger without leaving the driver’s seat. Q’POD is the industry’s first fully-integrated forward-facing wheelchair securement station specifically designed and tested for transit wheelchair passenger transportation. The system bolts directly into a bus, and its integrated shoulder belt eliminates the need for window brackets. Its stabilizing bumper works with the front tensioner and scooter ring – which allows for three-point securement and less aisle way trip hazards. According to Q’Straint, the QUANTUM system can secure a wheelchair in less than 25 seconds; from when the passenger pushes the occupant-secure button to final securement. The Q’POD reduces a four-point system’s securement time by half. 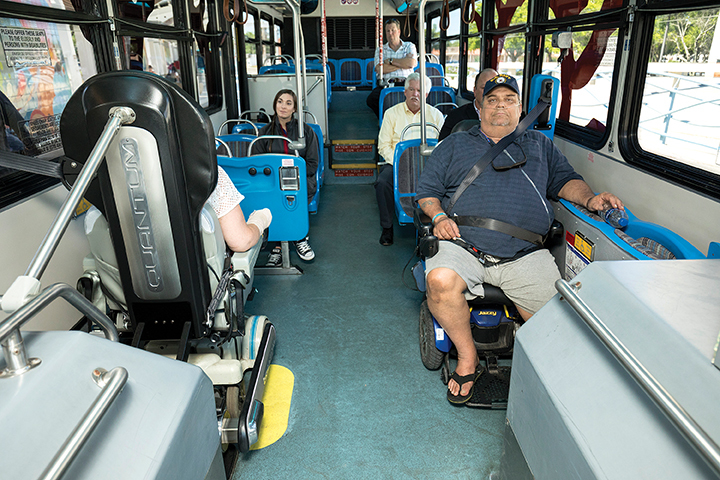 “This is so important because not only does it help the operator maintain the route schedule, it also reduces liability by providing a safe and easy method to secure difficult mobility devices,” Drouillard says. 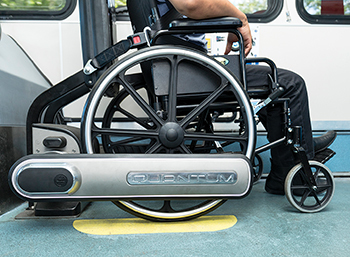 QUANTUM by Q’Straint is transit’s first fully automatic rear-facing wheelchair securement station. The QUANTUM was installed as a retrofit to an existing MCAT 35-foot bus. Typically, theatre style flip seats are selected for passenger use in this area and will most likely be added on new bus builds moving forward. In addition to hands-on training for the operators and route supervisors, Q’Straint also provided maintenance training for MCAT fleet technicians. The Q’Straint and MCAT teams took great measures prior to the installation to address any concerns regarding this new technology. 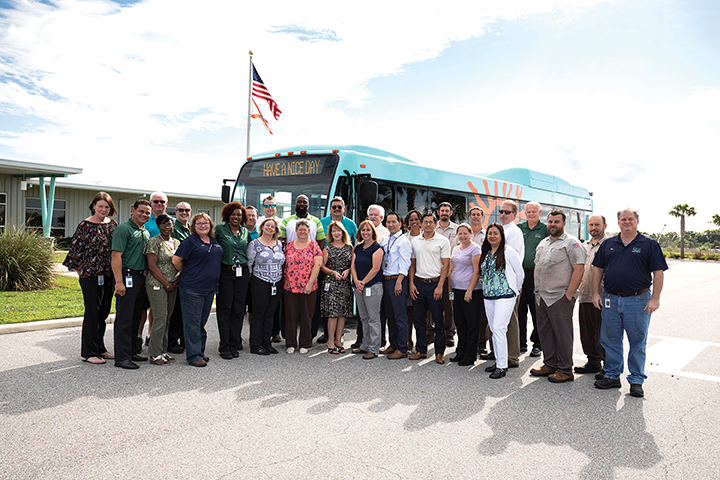 Educating the ridership and MCAT staff on the front-end is the key reason for the positive acceptance at all levels. Egbert says that first-time QUANTUM users are sometimes skeptical, as self-securement is a brand-new concept. Their first fear, he says, is of riding while rear facing. However, after using the system, passengers express their belief that this system offers a new sense of independence and another level of normalcy, when compared to transit ambulatory boarding passengers. He says that MCAT operators love the QUANTUM, because it allows them to stay in their seats while passengers self-secure their wheelchair device. Egbert says the Q’POD is also “a big hit,” as it’s a time saver and less invasive to the wheelchair passenger’s personal space, while providing a higher level of wheelchair securement during travel.